I thought I'd have a go at fitting a Gel Pad insert in my niner seat. I bought the pad from Dan Medica South www.danmedicasouth.co.uk for under £40, a roll of 1/2" open cell foam from ebay for about £4 to use as a smoothing foam and some spray adhesive I already had lying around, so total cost under £50. Having done a little research beforehand, I found a couple of useful websites - www.diymotorcycleseat.com and www.knoplace.com/Gel_Pad_Installation - both interesting sites offering lots of useful advice. First, remove the staples holding the seat cover in place. I was only fitting a front pad, so didn't take the cover completely off. Once you've done that, roll the cover back (or remove completely if you're fitting two pads). At this point, refit the seat to the bike and place the gel pad on top to determine the correct position for you. Carefully mark the position of the pad using a marker pen. Now it's time to remove some of the foam. What I did was use a stanley knife blade with some tape wrapped around it as a depth marker. I'd also decided at this point that I wasn't going to use the full size of the gel pad at the edges. I carefully trimmed to the depth of the pad (marked on the blade) about 1/4" inside the marker pen line made earlier and also about 1/2" in from the sides of the seat (the new width of the pad, not cut down at this point). Now you have some defined edges to work to, I remarked the seat with the marker pen at the cut and then used an angle grinder fitted with a worn 120 grit soft sanding disc. I have a variable speed grinder, so I used it at about half speed. Work by pulling the grinder towards you using very light strokes to remove the foam. Check frequently, it's very easy to go too far! This is the time to reshape the seat for more comfort if required. I softened the edges slightly and allowed for some extra "cupping". Once that's all done, drop the gel pad in the hole and get it as flush to the foam as possible. Vacuum the seat foam, base and cover to ensure there are no lumps when it comes to the final fitting of the pad and cover etc. Once you're happy with the fit, use some adhesive to fix the pad in place. If you've cut the pad down, use cling film to seal the edges before glueing in place. Now for the smoothing foam. As I was only using a pad in the front, I only fitted smoothing foam to the front part. I found it easiest to apply the adhesive to a strip lengthways along the centre and allow the glue to "go off" before proceeding. Once that's in place, work from the centre outwards to the edge of the seat base. Repeat for the other side. Once the adhesive is cmpletely "gone off", trim the edges around the seat base and use the grinder to blend the foam into the original seat foam. If you're happy with everything refit the seat cover. I found it easiest to work from side to side, one or two staples at a time until all had been replaced. Total time taken was less than two hours (first time I've done one). That's it - Simples! Sit back in your now comfy niner seat with coffee and, of course, cake. Edited by trevini, 03 April 2010 - 12:25 pm. That's very much what I did on my Africa Twin's seat. Otherwise I agree, it's a (potentially) effective and surprisingly simple update you can do yourself. I do have a natural tendency to sit quite a way forward on the niner. With the slight reshaping and angle changing (slightly more tipping to the front) it works for me, but yes, I am shorter than you. Think this should be placed in Knowledge Base. Nice write up, how did you refit the staples, did you just push the old ones back in or use new? Full Givi luggage, MRA flip screen with German import top blade, Garmin sat nav, LED running lights, heated grips, Fender extender. I used new with a heavy duty staple gun. Don't use staples any longer than about 5mm, or you run the risk of the staples coming though the other side of the cover. Nice job. 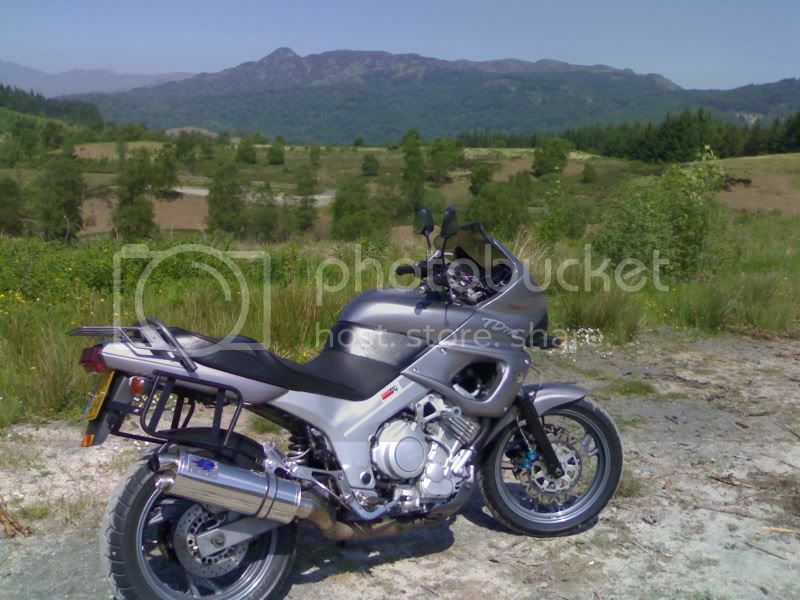 I tried the same thing with my SV650 but I bought a spare riders saddle in case I buggered it up. It was OK but not very neat. I found the easy answer though was a pair of gel filled cycling shorts, they worked a treat. On my French Spanish trip I managed a couple of 700 mile days and was in the saddle for about 13 hours one day when using smaller roads and had to get to my destination that day. Says a lot for the TDM that my artheritic body didn't have ache in it the days after.